Our journey began as we pulled away from our recently sold home on June 30th. It is now nearing the end of August and we still find ourselves in Brooklin, just miles from our old house. Although we sit here, patiently waiting but unable to get going for various reasons, the last 60 days have not been wasted. We had made a test run to visit my mother on Manitoulin island, a “shakedown”, to determine how well our current set up for the truck and trailer will work out in a real travel situation, as well as the day-to-day chores we’d have to carry out. We returned back to Brooklin 3 weeks later to make changes, adjustment and implement new ideas. Our clothes washing solution was a compact, manual, wash tub that you rotate to agitate the clothes. It had to be used daily due to its size, needed a lot of water for both the wash and rinse cycle, and required hang drying all day. In periods when we travel and do not have access to water it would be a huge burden. The alternative would be visiting a laundrette once a week. To make this work we had to buy the kids a few more changes of clothes from “The Village”, which Cynthia did in spectacular fashion for $50. The kids sleeping situation was also not idea. We found the 2-up bunk situation with the kids to be less than favourable since Isla, being on top, had no natural light or ventilation and the kids had no real place to play since the bunks were low. The boys in the bottom also had to deal with getting tangled with one another during the night. 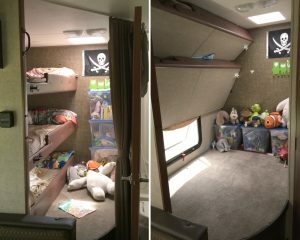 I decided to gut the area and turn it into 3-up bunk situation, which fold up and away to create a large carpeted play area with a newly installed sky-light vent. What a huge difference for a few hundred bucks. 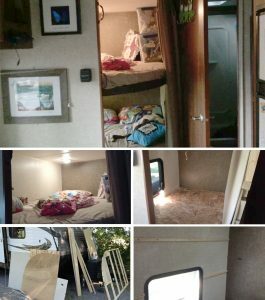 Before we made changes the top picture shows the dual bunk with Isla’s bed shown on the middle left with no natural light or ventilation. The other pictures show the work phase. After the changes the kids all have their own bunks, that fold up for a carpeted play area. The largest change was our truck. Our original truck was a half ton dodge ram with a weak 4.7 V8. It was at the towing limit of our trailer and it struggled up the slightest incline, revving like a Nascar, temperature raising wildly almost into the red. After consulting several friends who know trucks we decided a three quarter ton was better equipped for our situation, especially since we will be indefinitely towing our home. All the components of the truck must be set up for this kind of laborious towing. The fact is that anything can go wrong no matter what truck we have, we are at the Lord’s mercy, but the piece of mind, we determined, was worth the upgrade cost. Acquisition of this new truck and setting it up is what has taken us the remainder of the weeks leading up to this point. We found a vehicle we felt was right for us but because of various challenges with the seller, it has dragged on. We are in the home stretch now, hoping and praying for no more surprises so that we can finally get going; which will bring its own set of emotions as we set forth our of the sheltered harbour of our friends and family in Brooklin. The journey will have truly begun at that time. “Dorthy” (left) was not powerful enough for the long haul. Hopefully “Charley” (right) will get the job done with less fuss. This brings me to why it wasn’t a waste of time waiting for all of these changes to happen over such a long period. We had tremendous opportunities to re-visit family and friends, participate in evens we thought we otherwise miss, like our church bonfire and a board gaming convention I helped start. Also, the little fixer-ups and errands we needed to run amounted to many, many days. In the end we this time was very much needed and turned out to be a great blessing to us. These was rarely a day we were not busy. True, it can be seen as us becoming complacent, but the eagerness within us to get moving has not vanished. We are shooting for the day after labour day to get going, which will be prefect for our next destinations, since all the kids will be back in school.